Tall in stature, handsome and red-headed... he had many outstanding, praiseworthy qualities. As a soldier he attained the greatest glory, dedicating himself to the defence of the community and to the liberal arts. He strove to be loved and was honourable to his friends... his words were always good-humoured and his principles admirable... This man was an energetic soldier and more shrewd in his upright dealings. He was meticulous in his justice and of strong character. He did not allow himself to be corrupted by excess or sloth, but spent his time riding about the country and performing illustrious feats. By such acts he endeared himself to all, and smote fear into the hearts of his enemies. He was usually affable and jovial to all, especially soldiers. It was clear that Matilda would need a new husband to bolster her claim to succession.... Henry now sought an alliance with the counts of Anjou. He contacted Fulk V and negotiated a marriage alliance between Matilda and Fulk's eldest son, Geoffrey. On 17 June 1128 the couple were married in the Norman-Angevin border town of Le Mans. 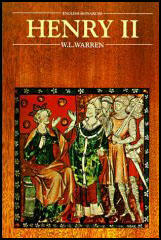 The Empress Matilda was twenty-six years old. Her groom was fifteen. John of Marmoutier recorded that the marriage was celebrated "for three weeks without a break, and when it was over no one left without a gift." On his wedding day, Geoffrey of Anjou was a tall, bumptious teenager with ginger hair, a seemingly inexhaustible natural energy and a flair for showmanship. His fair-skinned good looks earned him the sobriquet Le Bel. 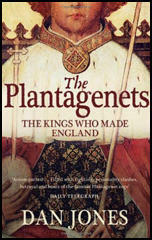 Tradition also has it that he liked to wear a sprig of bright yellow broom blossom (planta genista in Latin) in his hair, which earned him another nickname: Geoffrey Plantagenet.... A week before he married Matilda he had been knighted by Henry I in Rouen, dressed in linen and purple, wearing double-mail armour with gold spurs, a shield covered in gold motifs of lions, and a sword reputedly forged by the mythical Norse blacksmith Wayland the Smith. 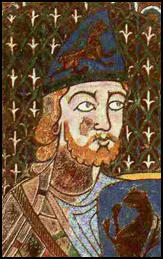 As soon as the marriage was completed, Geoffrey became count of Anjou in his own right, as Fulk V resigned the title and left for the East, to become king of Jerusalem.